The HP Laserjet Enterprise M4555h Mfp is a capable network mono laser multifunction printer designed for medium to large sized offices with huge printing demands. It offers a versatile network friendly interface with good output quality and high print speed. The printer supports high capacity HP Laserjet Enterprise M4555h Mfp toner cartridges which can yield up to 24,000 pages at a time. The device weighs 52.34 kg approx. and measures 43.7 x 35.8 x 32.4 inches respectively. It has an 8.07’’ colour touchscreen control panel. The printer has a flatbed scanner at the top. It also has an ADF support and an auto-duplexer for printing on both sides of a sheet of paper. The printer comes with an input tray which can handle up to 500 sheets of paper and a 100 sheet multipurpose tray. The HP LaserJet Enterprise M4555h MFP offers USB and Ethernet connectivity. The device comes with a printing resolution of 1,200 x 1,200 dpi with print speed up to 52 ppm. The printer runs on 800 MHz processor and 1280 MB of RAM. It supports 120GB encrypted hard disk drive. It also supports security features which allow users to secure their documents with PIN-protected printing. The HP Laserjet Enterprise M4555h is a multifunction printer designed for small offices and large business workgroups that demand high volume print jobs. The printer has ADF support, an automatic duplexer, USB and ethernet connectivity, security function and 120GB encrypted hard drive. However, its high initial cost, absence of fax feature, lack of Wi-Fi connectivity and mobile printing capabilities might make the users think twice before going for it. How to Resolve print quality issues with a simple checklist? Many of the print quality issues of an HP Laserjet Enterprise M4555h Mfp are not that terrible as they seem. Such issues can be resolved by following a simple print quality checklist to make sure all the parts of the device are up and running. The list also tells what step to take if anything is not running right, for example, most of the print quality issues can be resolved by simply replacing the HP Laserjet Enterprise M4555h Mfp toner cartridges or cleaning the device. The control panel must indicate the ready status. If it is not at ready-state and showing an error message, resolve that error first. If the error is related to low ink or empty cartridge then replace your HP Laserjet Enterprise M4555h Mfp toner cartridges first, before proceeding further. Make sure that the input sheets that you are using meet the HP media specifications. Q. How can I differentiate between a toner and an ink cartridge? A. Toner cartridges are powder contained that includes carbon powder and mostly used in laser printers, while the ink cartridges are used in inkjet printers and are filled with liquid ink. Q. Does this printer have ADF support? A. Yes, the printer has ADF support and has an auto-duplexer for printing on both sides of a sheet of paper. Q. What is the capacity of HP CE390X for printing black and white documents? A. 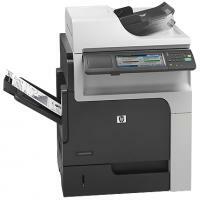 One can print upto 24,000 black and white pages using HP Laserjet Enterprise M4555h Mfp toner cartridges. Q. Does the kind of paper I use for printing affect my print quality? A. Paper quality made a huge impact on print quality. It really makes a difference if you are using good quality paper or not. You will yield best results if you use the paper that has been recommended to use. Medium weight and brightness paper will produce a better quality print job than a low weight and low brightness paper. Q. Can I store HP Laserjet Enterprise M4555h Mfp toner cartridges for much longer time as was planning to store them in bulk? A. Yes, The minimum shelf life of cartridges is utmost 6 months. The only risk to store the cartridges for long time is that the ink inside them will dry up. If stored correctly in cool and dry place, and used before its expiry date, HP Laserjet Enterprise M4555h Mfp toner cartridges should work fine for your printer. Q. When is the correct time to replace the cartridges? A. Most of the printers are programmed in a way that they tell you in prior when to change your cartridge or the ink level of your cartridge. These methods are programmed to give you early warning that your cartridge is getting low and it will require a replacement in a near future. Use this warning to purchase your back up cartridges, but keep the current cartridge in your printer until you notice poor or faded prints on your paper. Q. Can I mix the ink of both the original and compatible toner cartridges in my HP Laserjet printer? A. No, It is not recommended to mix the ink of original and compatible HP Laserjet Enterprise M4555h Mfp toner cartridges to avoid any type of complications . Q. What quality assurance i will get, while picking up the compatible HP Laserjet Enterprise M4555h Mfp toner cartridges from your site? A. The compatible range of cartridges are really recommended as these are the refilled cartridges that produce same print quality assurance as one get while using the original ones. Also, they are quality assured as are fully tested and manufactured by the professionals and offer full customer support service . Q. Recently noticed that the print results were not satisfactory. What should i do to improve the print quality of my HP Laserjet printer? A. You can prevent most of the print-quality issues by following these simple guidelines. Use the correct paper type setting in the printer driver and use the one that meets HP specifications. Clean the product as necessary. Replace the HP Laserjet Enterprise M4555h Mfp toner cartridges when it has reached the end of its estimated life and print quality is no longer acceptable. Use the printer driver that best meets your printing needs. Q. I tried printing from my printer, but found that the connection is poor. By what implies I can recognize the Poor physical connection for my printer? Verify that the product is attached to the correct network port using a cable of the correct length. Confirm that all your connections are secure. Look for the network connection port on the back of the product, and verify that the amber activity light and the green link-status light are lit. Q. How can i maximize the uptime while using the high-quality HP Laserjet Enterprise M4555h Mfp toner cartridges? A. One can easily optimize the printing performance while using the enhanced HP toner. As you receive an alert message for low toner, can shop for the compatible cartridges ones from our site to carry out the replacement procedure. This saves your time, as we offer the high-quality cartridges at high printing speed without sacrificing at the print quality. One can save time with easy installation procedure, and can get exceptional value from optional high-capacity HP Laserjet Enterprise M4555h Mfp toner cartridges. Q. I have to achieve professional-quality printouts. Does the cartridges you offer will suit my printing needs? A. You can easily make a professional impression with bold, crisp text and sharp, black graphics. Rely on consistent results and optimized print quality, you can choose the HP Laserjet Enterprise M4555h Mfp toner cartridges for better reliability and avoid frustrating reprints, wasted supplies and delays. Thus you can achieve consistent print quality from a cartridge designed and tested to suit your printing needs. Q. Does buying the compatible cartridges produces outstanding energy and paper saving features? A. Yes, one can reduce the energy use with instant on technology and instant on copy feature. This will conserve the resources and save paper by performing automatic two-sided printing. Usage of high-quality toner cartridges with energy-efficient features enables energy savings and result in good quality printouts. Q.What are the various image defect issues you can get while using the old, dried out HP Laserjet Enterprise M4555h Mfp printer? A. The Image defects, no matter the cause, can often be resolved. Use the following steps as a starting point for solving image defect issues. Step 1: Try reprint the document. Print quality defects can be intermittent in nature or can go away completely with continued printing. Step 2: One should keep a check on the condition of the cartridges. If a cartridge is in a Very Low state (or has passed the rated life), replace the HP Laserjet Enterprise M4555h Mfp toner cartridges immediately . Step 3: Make sure that the driver and tray print mode settings match the media that is loaded in the tray. Try using a different ream of media or a different tray or by using a different print mode. Step 4: Make sure that the printer is within the supported operating temperature or humidity range needed for quality printing. Step 5: Make sure that the paper type, size, and weight are supported by the printer. See the printer support page at support.hp.com for a list of the supported paper sizes and types for the printer. Q. What steps should I follow while replacing the toner cartridge of the HP Laserjet Enterprise M4555h Mfp printer? Pull the top cover release lever to open the cover of printer. Grasp the handle of the used cartridge and pull out to remove. Store the used toner cartridge in a protective bag. Information about recycling used cartridges is given on the print-cartridge box. Remove the new HP Laserjet Enterprise M4555h Mfp toner cartridges from its protective bag. NOTE: Be careful not to damage the memory tag (callout 1) on the cartridge. Grasp both sides of the cartridge and distribute the toner by gently rocking the cartridge five or six times. Remove the orange, plastic shipping lock from the bottom of the new cartridges . Pull on the orange tab to remove the toner sealing tape. Completely remove the sealing tape from the cartridge. CAUTION: Avoid prolonged exposure to light. Align the HP Laserjet Enterprise M4555h Mfp toner cartridges with its slot and insert the print cartridge until it clicks into place. Close the top cover and try printing a test page first.